After just finishing my first weekend of my Yoga Teacher Training (YTT), I am left feeling empowered, inspired, and enlightened. I’m excited to know what’s going to happen next; I can’t wait for my next training weekend. It’s with great joy and passion (maybe a little nervousness too) that I get to share my journey with you. It wasn’t long ago when I was traveling around the world full time dabbling in yoga and realizing with each new destination that I visited, that I was falling more and more in love with practicing yoga. It’s something I can do anywhere. Since returning to eastern Canada, I decided that I would pursue this newfound passion at home. Practicing yoga connects me to the places I recently visited and helps me to visualize the places in my mind and transport me there, as if I haven’t left. With practicing yoga regularly (I’m up to practicing 5-6 days a week) I’m faced with the challenge of finding a yoga mat that will support the various styles of yoga classes I attend. My sea green Kharma Khare Hybrid Bliss yoga mat is uniquely two yoga mats in one, which allows me to have an all-in-one yoga mat perfect for any style and practice. One side of the Hybrid Bliss yoga mat is made of 4 mm of highly supportive non-slip rubber, sourced from 100% recycled tires perfect for ashtanga to hot yoga (it’s super ‘grippy’), while the other side is lined with 1 mm of supportive natural rubber latex from sustainable rubber trees prefect for yin yoga (among other styles). It’s the high performance of Kharma Khare’s Yoga Reincarnated mat, but topped with natural rubber creating an even more versatile yoga mat. The Hybrid Bliss has been designed for both rigorous and meditative yoga practice in mind. 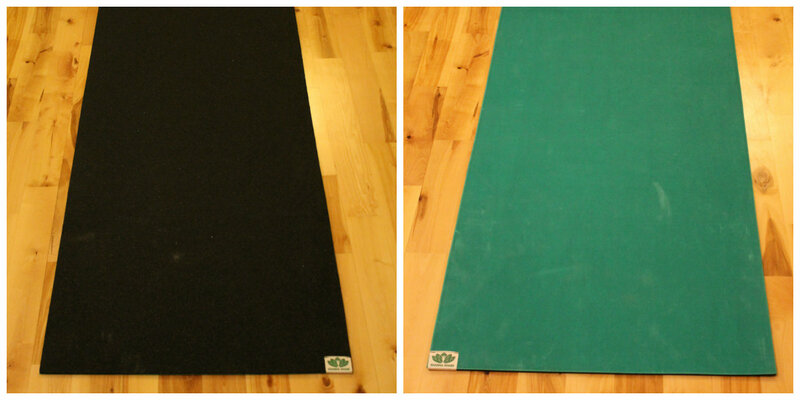 With my hectic weekly yoga practice schedule, it’s nice to have one yoga mat designed for all classes. I don’t always know in advance which class I am going to attend and I’m not interested in carrying around two yoga mats anticipating which class I am going to do that day. 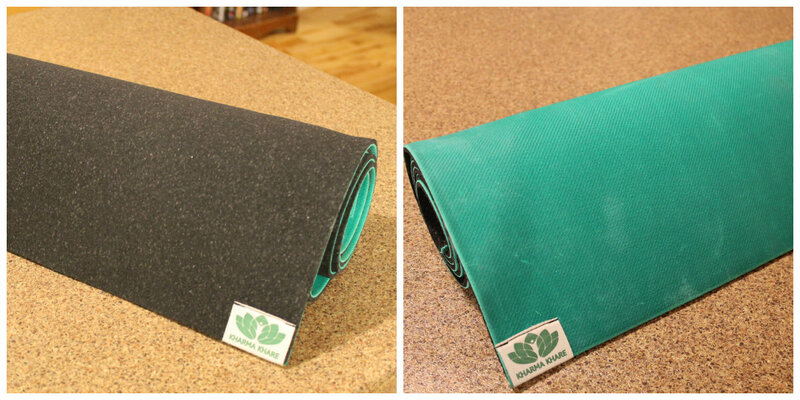 Kharma Khare makes it easy with their Hybrid Bliss yoga mat, which gives me the convenience of having two mats in one. With one mat in tow, I’m ready for any class. Kharma Khare’s eco-friendly, non-slip, and high performance yoga mats are uniquely repurposed from recycled rubber car tires in a innovative and environmentally conscious manufacturing process. 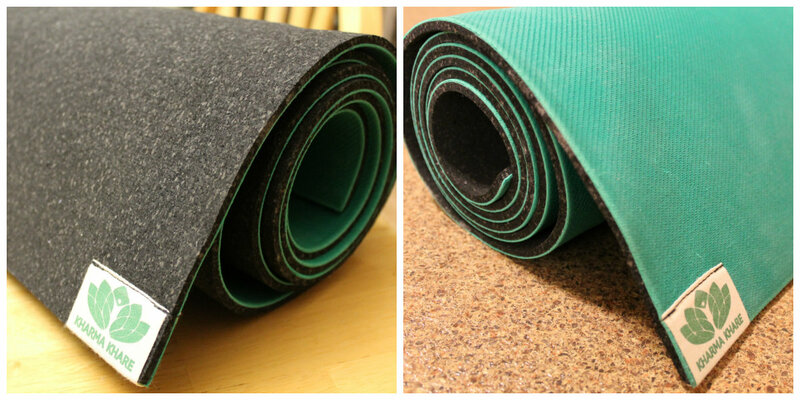 One yoga mat equates to 1/3 less of a tire being thrown into a landfill or burnt for crude energy. The two-in-one Hybrid Bliss is made from both recycled and sustainable materials. If you are someone like me who is concerned about a carbon footprint, you can feel confident to use a Kharma Khare mat that has minimal impact on our planet. 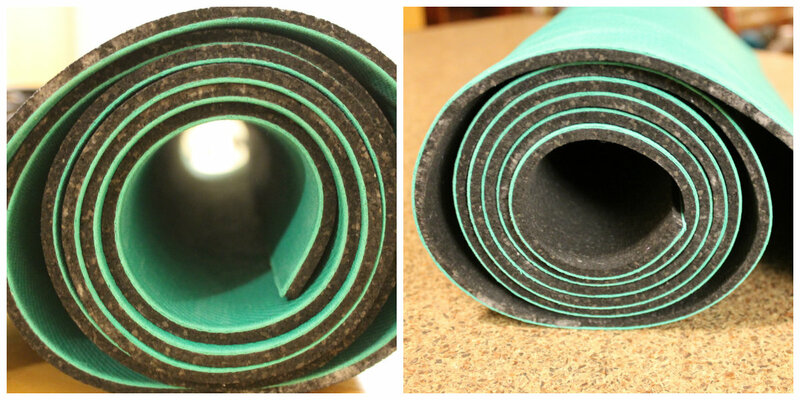 Unlike some yoga mats, the Hybrid Bliss contains no PVC, polyurethane, or polyester. To my surprise, Kharma Khare removes all the unhealthy materials from rubber tires, leaving only a material that is totally safe for your skin and is non-toxic. It gets even better, when you are ready for a new yoga mat, you are able to send back your old mat and they’ll credit you half the price of the new mat. They’ll take the old mat and melt it down for new mats or donate it for the use in children’s playgrounds. So creative! Who would have thought that waste could be transformed into something used for yoga practice. How much more sustainable does it get? I learned that Kharma Khare yoga mats do not have a “break in” period, but are ready for practice from the moment of purchase. From the first use, my new multi-purpose Hybrid Bliss provided me with excellent grip; the high performance claims lived up to their potential. The mat can be easily cleaned with chemical free cleaners or handy mat wipes. The fact that I can use my Hybrid Bliss yoga mat for heated and non-heated classes, as well as for Pilates makes it an extremely functional mat. The material used provides complete traction and balance, even when the mat gets wet from sweat (or from using it at the pool or on the beach). The thickness of the mat (it weighs 8lbs) makes it the perfect mat to use on any surface including uneven surfaces (like a boardwalk or promenade for example). I’m all for having a yoga mat that you can take with you and use anywhere! It might as well be versatile like I am as a traveler. 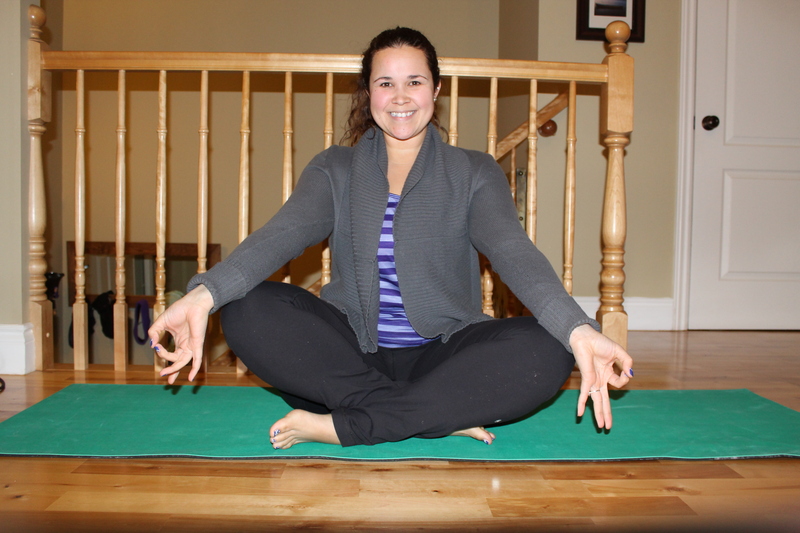 I was surprised how much cushion and stability the mat provided, especially when I use it for restorative postures. It’s the perfect blend of support and traction. My elbows and knees don’t get sore during the most difficult poses. It’s nice to not have to worry about grabbing a prop to support me in an asana when the mat does the job for me. Kharma is something that comes back to you — it’s all about cause and effect. It’s nice to see a company care about the planet enough to make a difference. Kharma Khare’s actions are speaking louder than words, as they truly care about the consequences of their actions and are living what they preach. This past weekend, my YTT taught me that it’s important to teach yoga from where you are and to teach what you live and live what you teach. If we are not living what we are saying then people will see right through us. We are not perfect or the best, but we are more than just “good enough”. I learned that we are to be the best that we can be. What you see should be what you get. Kharma Khare is doing just that. I’m happy to support a company who supports our world. Kharma Khare has some good kharma coming their way. Media coverage for Kharma Khare. This entry was posted in Lifestyle, Reviews, Yoga and tagged Fitness, Health, Hybrid, Hybrid Bliss, Hybrid Bliss Yoga Mat, Kharma, Kharma Khare, Turquoise Compass, Yoga, Yoga Mat, Yoga Teacher Training, yogi, YTT by Turquoise Compass. Bookmark the permalink. I’m sure they ship from the US! Oh, that’s too bad! I’ll let you know if I find something similar that will ship your way. I love my hybrid bliss, but it tends to leave dust like pieces everywhere after each practice. I wonder if it’s the same for everyone. Also, is there a way I could do a through cleaning of the mat? I’m so glad you also love your Hybrid Bliss. I love it. I haven’t had the same experience with the mat as you have had. Which side do you feel is leaving dust? Do you use it in the sun? That might be the culprit. The best way to clean the Hybrid Bliss would be to follow these instructions from Kharma Khare. I make my own natural cleaner by mixing water and tea tree oil in a spray bottle.